If today students of social theory read Jurgen Habermas, Michel Foucault and Anthony Giddens, then proper regard to the question of culture means that they should also read Raymond Williams, Stuart Hall and Slavoj Zizek. 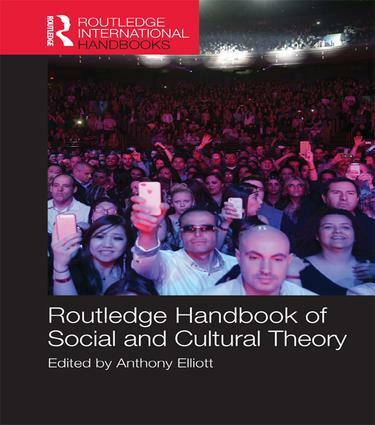 The Routledge Handbook of Social and Cultural Theory offers a concise, comprehensive overview of the convergences and divergences of social and cultural theory, and in so doing offers a novel agenda for social and cultural research in the twenty-first century. This Handbook, edited by Anthony Elliott,develops a powerful argument for bringing together social and cultural theory more systematically than ever before. Key social and cultural theories, ranging from classical approaches to postmodern, psychoanalytic and post-feminist approaches, are drawn together and critically appraised. There are substantive chapters looking at – among others – structuralism and post-structuralism, critical theory, network analysis, feminist cultural thought, cultural theory and cultural sociology. Throughout the Handbook there is a strong emphasis on interdisciplinarity, with chapters drawing from research in sociology, cultural studies, psychology, politics, anthropology, women’s studies, literature and history. Written in a clear and direct style, this Handbook will appeal to a wide undergraduate and postgraduate audience across the social sciences and humanities. Cultural and social things: Is there a difference?